Bananas. I ate so many bananas! They are the perfect snack food, like a granola bar or energy bar. 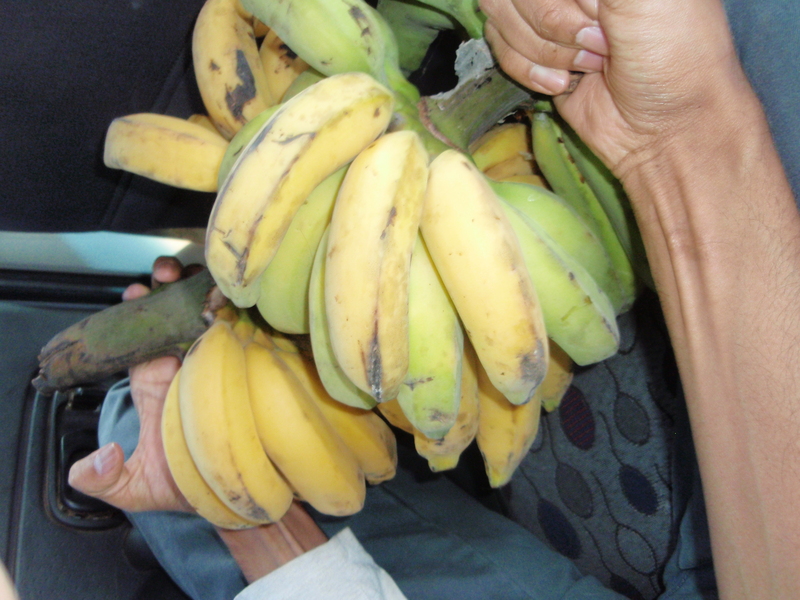 Bananas are filled with nutrients, cheap, safe to eat, and everywhere! The top picture is of the things we needed for our simple temple wedding blessing. It was a no-fuss ceremony. It was nice to feel included and I’m very thankful to have had the ceremony. We were blessed by many members of Satya’s family. This made our fourth wedding ceremony and now we are done! 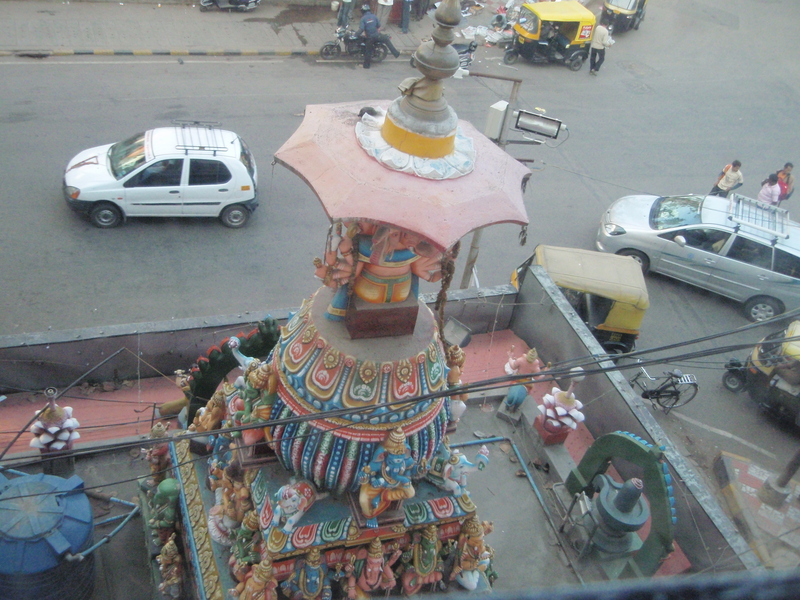 The other picture is one of the first pictures we took in India-out the window of our Bangalore hotel room. We were looking onto a very busy street corner early in the morning. People would stop at the temple to pray on their way to work or to school. 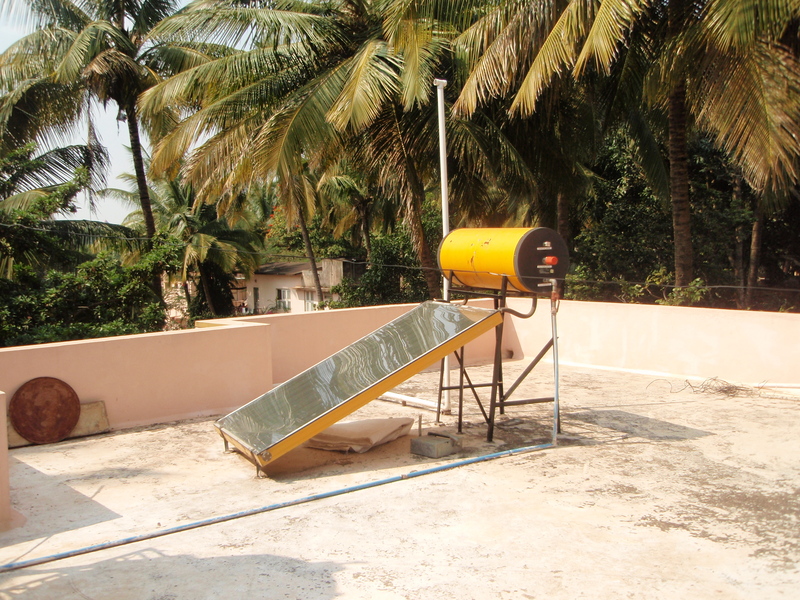 The solar water heater on the roof of Satya’s home. The U.S. has a lot to learn from India in regards to energy efficiency. Usually, this worked very well (sometimes too well!). A view from the roof again. 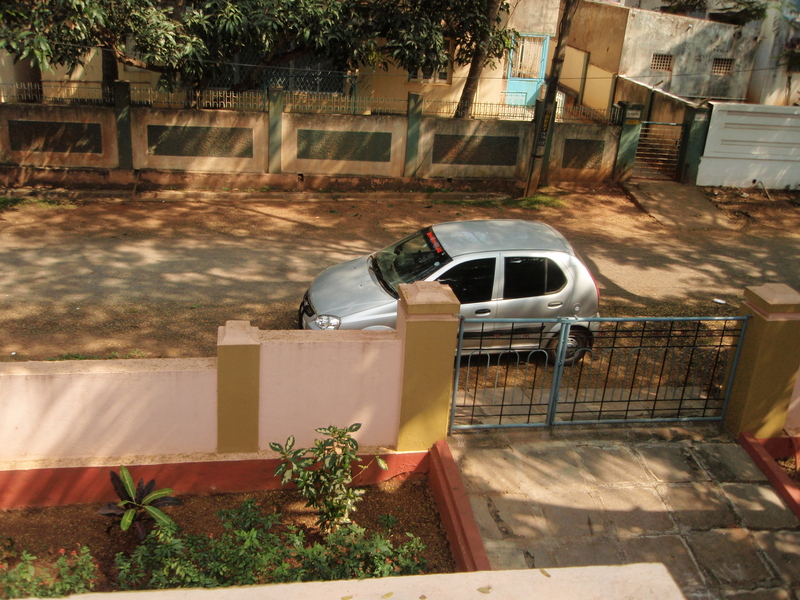 This is the Tata Indica that seems to be very popular in India. Very nice car, loaned from family friends. We would load up to 6-8 people into this sometimes. I liked zooming around, listening to booming Bollywood music on the cd player, and being crowded amongst family. 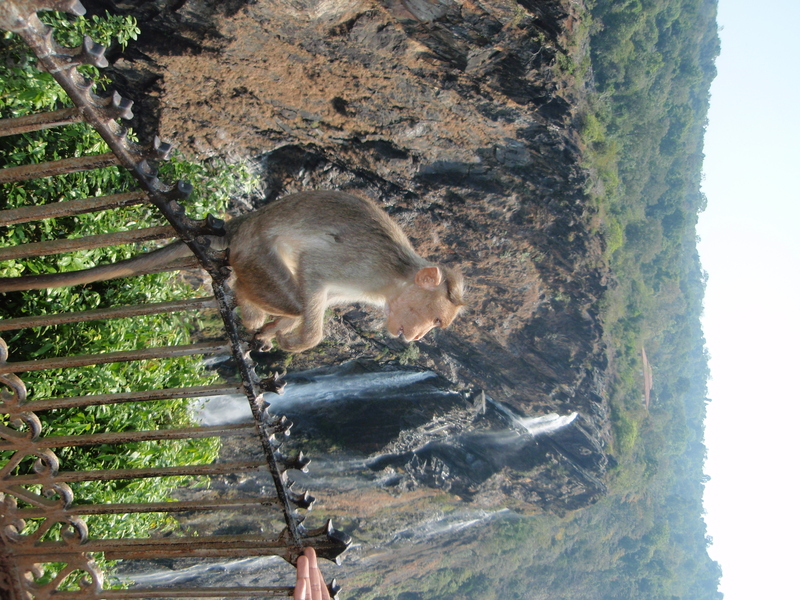 Monkey at Jog Falls. Kids+Snacks=Being followed around by monkeys. They are cute at a distance. One of them snatched a bag of snacks from the 5 year old which was a little unsettling. The monkey then proceeded to put the plastic bag over its head and empty all the snacks onto the ground. Monkeys are also a fact of life in town. Satya’s mom has had monkeys walk into the house and steal bags of peanuts from the kitchen. Also, sometimes at night the monkeys will sleep in the trees which means they will pee in the yard in the morning. Monkeys are also known to steal purses. In India, nature is an integral part of life. 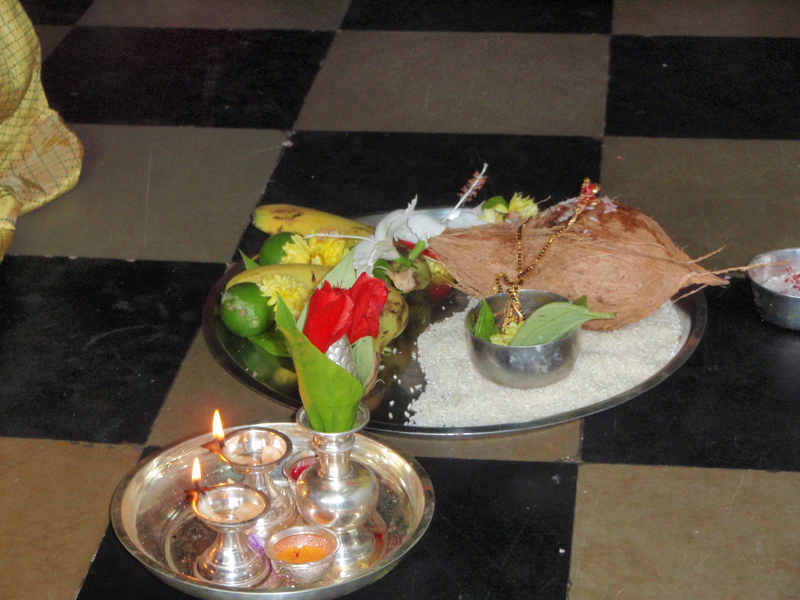 Every ceremony involves local plants. Animals are respected. The moon is important because it keeps the time of the Hindu festival calendar-every festival seems to either be on a full moon date or a new moon date. Here in the U.S. the moon is completely ignored. 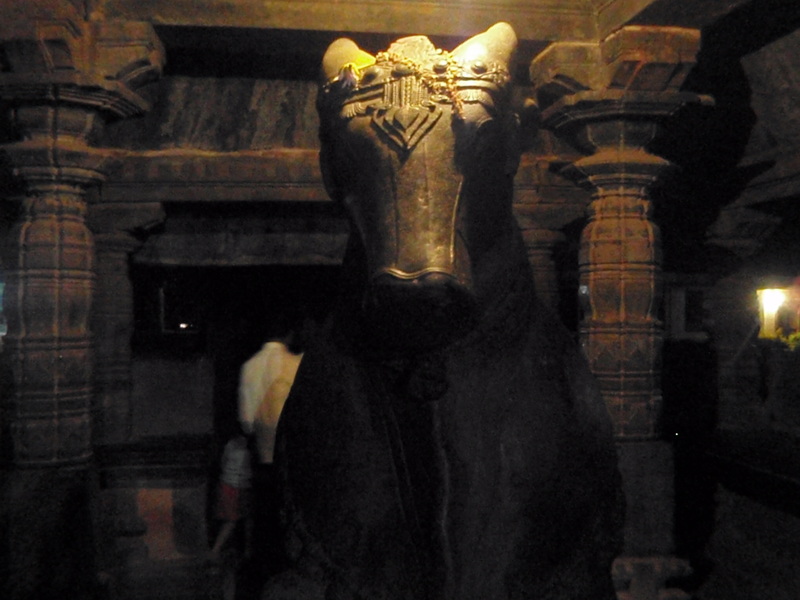 I saved the best for last…Nandi at the temple at Banavasi. Nandi is the bull who is Shiva’s faithful companion. Wherever there is Shiva in a temple, there will usually be Nandi looking in the direction of Shiva. This particular Nandi is special because he is looking at both his parents, one eye towards Shiva and one towards Parvati. Satya’s cousin told me this is to remind people that both parents are to be respected equally. I love that message. Love to run? Often bothered by running injuries? Wonder how people can possible run distances of 50 or 100 miles over inhospitable terrain? This week I am reading “Born to Run: A Hidden Tribe, Superathletes, and the Greatest Race the World has Never See” by Christopher McDougall. The basic premise of the book is that most of what we think we know about running is wrong. Sometimes less is more. Are fancy, expensive shoes with custom orthotics the best for your feet? According to the author and many in the book, the answer is no. Is that really how Hindus believe the world will end? I don’t know. I know Satya does believe that this time we live in is the “Kali Yug”, a time of more evil than good, but we don’t sit around waiting for the world to end around us. I was also disappointed when the author was asking a training coach about how he can learn to run injury-free. He asked about yoga. The coach said something like “The runners I know that do yoga get injured.” What do you think? Unfortunately, the author skimmed over this observation and didn’t give reasons why the coach said that. The book ends with an account of a 50 mile race between some of the best ultra runners in North America and the Tarahumara Indians. The Tarahumara call themselves the Running People and can run many miles on narrow, steep paths among desert canyons. I will not say who won the race, but McDougall’s account is exciting and hard to put down. I loved the eccentric, larger than life characters such as Barefoot Ted and Caballo. I enjoyed learning about the Talahumara Indians of Mexico and some of their traditions (don’t just walk up to their door. You have to sit a few meters off and look away and then wait for them to invite you inside. If they don’t, then you leave quietly.) The bits of science were intriguing too. I never heard before that people were meant to run, and that running gave us an edge over the Neanderthals. Another scientist believes that running and hunting gave human brains the push it needed to cross over from purely survival thinking into logic, humor, deduction, etc. He lived with the Bushmen of the Kalahari and actually did run down an antelope with a group of hunters and actually did hunt by imagining the actions of animals. So will you see me running miles upon miles barefoot? Perhaps not, but this book did give some interesting and convincing arguments to rethink some common running beliefs I’ve had since high school such as “Always stretch before a run,” “Get running shoes with lots of support and replace them often”. It also supported Satya’s belief that it is possible to live a healthy, strong life as a vegetarian and gave some reasons why he has seen so many bunions here in the U.S. and many fewer in India. Overall, I enjoyed reading this book and will recommend it to my sisters who love to run and to my aunt in Iowa who loves going barefoot. For a link to a Time interview with McDougall click here.